means absolutely nothing to them. Studying. We know we need to do it, but isn’t it sometimes just a drag? So repetitive, so boring. Right? 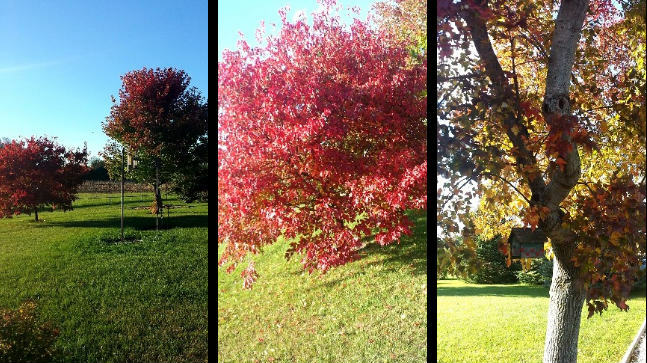 Wait… so there’s a way to make studying…. fun? Just note though, it is all up to you to find the right method to study. No one knows your learning style as well as you do. It’s up to you to be dedicated and willing to make a change in your study habits. And you’re lucky you’re going to be introduced to - or reminded of - 4 amazingly awesome options right now! Not only are they fun to make, but, studies have shown that information is more likely to stick with you if you write it in different colors! So, be creative. Maybe even associate different symbols with different terms. For example, you’re preparing for a history test and you need to define who Christopher Colombus is. 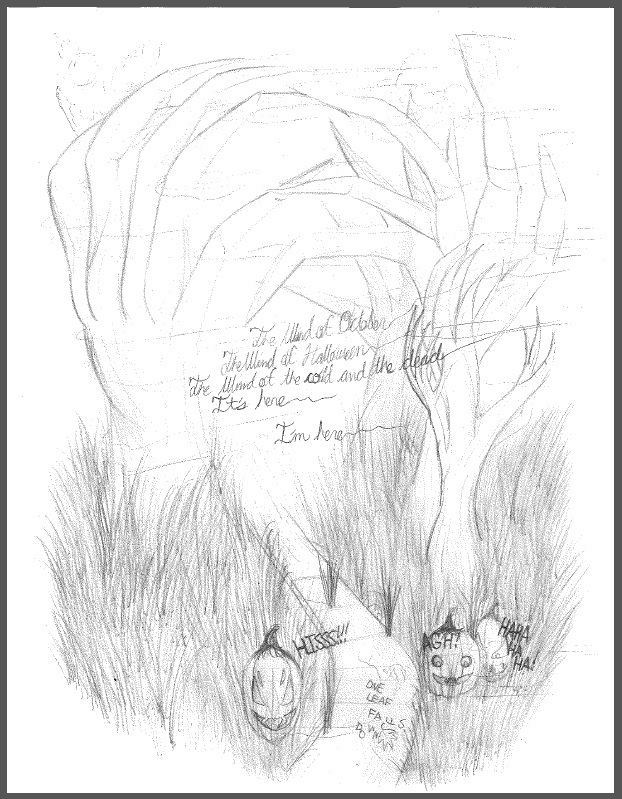 On the flashcard/notes, write the description of who he is and draw out symbols that you feel represent him in some way. Maybe draw the boats he sailed in or what kind of goods he traded. The more colors and symbols the better! Fun online videos are a great tool to use if you’re confused about what you’re learning, if you want to perfect your knowledge on something, or if you just want to learn about something new for fun and have the information stick with you! But, what kind of “fun online videos”? What does that even mean? Click on the example video to the right on Christopher Columbus. This song associated with his journey that will surely be stuck in your head for a little bit. One of the most effective ways to study is putting the information you’re learning in your own words. Making your own rhyme or song associated with what you’re studying is IDEAL. The more weird and unique, the better and more easy it will stick with you! But, what about people who aren’t creative? Well, that’ll just take you back to #2: Fun online videos. You can research songs and rhymes that other people have made. 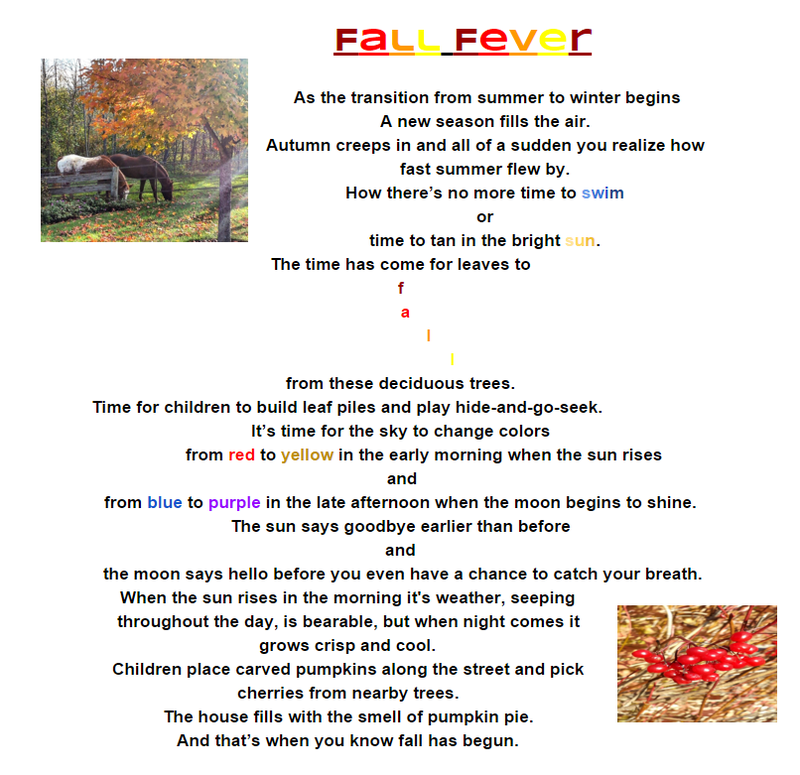 Click on the example to the right, a song someone created about World War 2! Let’s say you want to memorize a formula for math or who fought who in World War 1 for history. Or maybe you need to memorize how to say what your name is and what job you want to have when you’re older in Spanish. But, repetition isn’t fun. It’s boring. Well, not if you use some of the following methods! KEY STRATEGY FOR MEMORIZING CONCEPTS: When using any of these methods, make sure to put the information in your own words and keep changing up the phrasing- maybe even explaining it to a family member repetitively! For example… you want to memorize what the definition of an element is. And then you’d break it down into your own words, step by step. Putting things/phrases in our own words is a great way to head for success in memorization/understanding. Holistically, you have a ton of tests and assessments ahead of you, and final exams are right around the corner. It’s better to be safe than sorry, right? Study up, and use the right techniques for you! I stared hard at the screen, with all of the lights off, allowing the light from the screen to draw me in even more as my father walked up onto the stage past his two head managers of his company - Eric Tacheny and Riley Strawburt - to the podium. The crowd was cheering as the screen behind him went from black to white, with lines fading in out and out on it. I took notice notice of the words, “my son sent away from me,” and immediately had a flashback to the day that I was sent to my aunt and uncle’s home. I remembered that my dad sent me there, as he couldn’t take care of me or himself mentally. He thought that it would be better to be there with my aunt, uncle, my two cousins Max and Gavin, and my two long-time friends Ben and Dark, rather than be at home with him; however it wasn’t great, as my aunt and uncle neglected me, and my cousin Max was always up in his room, playing on his console wasting his life away. It allowed me to spend more time with Ben and Dark, though It didn’t help that my cousin Gavin was dying of lung cancer, and all the three of us could do was watch him cough severely and slouch over in that wheelchair. That was until he was miraculously saved by the anonymous player, who donated the one-billion-dollar prize towards finding the cure for all cancers, and the cure was found. My cousin lived, and I spent two years there, with Ben and Dark, Gavin and Max, my aunt and uncle, until my dad showed up, and took me home. I haven’t seen them since. The crowd looked at each other with confused faces, and even I questioned what my dad was saying, and leaned in on the sofa as his speech continued. He stated, “When I lost the competition, I felt like there was nothing in the world that I could do, until my two high-school colleagues here...” he gestured his hand to them, “...came to me and said that they had something that would be revolutionary to the world. At the time that there was nothing better to do, so I went to see it. I remember them giving me the serum, and having me enter this world, which according to their explanation, is a place that existed between our conscious and the sub-conscious that could be manipulated to your will, allowing you to create anything at all. It's all in your head, while still having the effects of normal, everyday life. In other words: it creates a visual representation of your imagination you can go into at any time. We then found a way using patterned electric pulses to send data to your head, allowing the 'space' to be a programmed world of a game, specifically ours, with your attributes thrown in. It’s fantasy, but very much real.” He smiled as he panned his vision across the crowd, awed by the revolution; even I had my jaw hung wide open in shock. He then continued by saying, “I will be releasing this game on December 15, 2015, and many of you have wanted me to reveal the title of it. So I hereby announce the new game,” he paused, and the crowd and I snapped out of our awe to hear the title. 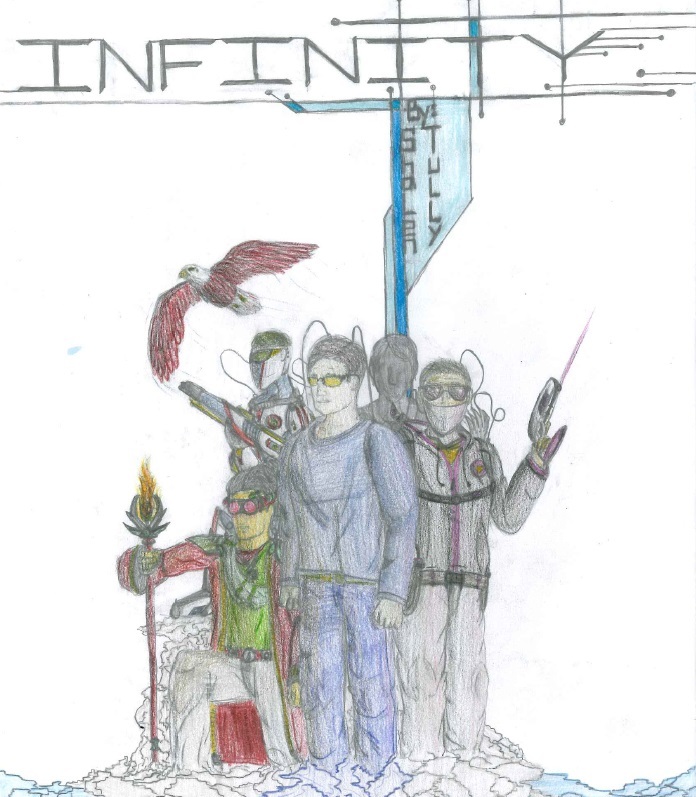 “Infinity!” he exclaimed and the faded lines on the white screen darkened, and moved around to form the word "Infinity” across the screen. The crowd’s cheering roared through the speakers, and I quickly grabbed the remote on the coffee table to turn it down. I then leaned back on the couch, and let the word sink into my brain. "Infinity." I felt that the name was perfect, with it being a game that takes place in your imagination in some capacity that makes it seem that it could go on forever. That you could play games for the rest of your life as if it would feel like real-life, but then have things that wouldn’t exist in the real world, like haunted robots, and toy-car races in a giant stadium, or surviving a zombie-apocalypse, and even more, all in your head, and you would feel it all too! The sounds would be right in your ear, the smells going into your nostrils, the grip of you actually holding a flashlight, sword, or gun, and the pressure would be even more intense. It’s a gamer's dream to have the best experience possible, and my Dad just found the best one yet. Even though it took him a six-year process - two of which were him going to a therapist and trying to find a good-paying job for a while - it all paid off in the end, even for my cousin, who survived, thanks to the gamer that led my Dad down the right path, right? I shook my head, and said aloud, “No, it was the right thing to do; it led him down a path that had it’s rough edges at first, but worked out for everyone in the end. Even his mental issues haven’t been as bad at home recently, which is good. Right? Oh for God’s sake, yes it is Shalen, now shut up, your Dad’s talking!” I looked back at the screen, and saw my Dad about halfway through his speech. I turned back up the volume on the television, and listened to my father. He stated, “If you so desire to use this system slightly earlier than others do, then you can sign-up for the beta access here on my website 'www.WilsonProductions.com/Infinty_mainframe/' to have a spot in the game, before it comes out. You can also see the alpha-testers, who either were invited or volunteered, and gave their life to try the game out. Well, I hope to see everyone here on that list in a couple of days. Thanks for all of you, gamers, for coming to support me, thank you to my friends for bringing me to this point, and have a good day.” He then turned around, pulled his tie, and walked towards the stairs leading off the stage, leaving everyone cheering and clapping, as he went down the steps, walked to the car parked nearby, hopped in, and drove off inside it. Once the car was out of shot, I paused the TV, and sat back in the couch for a moment. I thought about how my dad mentioned how we could sign-up for the game, and I quickly left the living room, went down the hallway to my room, landed in my chair, spun it to my computer, and logged in. I then opened up my browser and typed in the website heading my dad said moment ago, and read what I had typed out to make sure it was right. Once I saw that it was right, I hit enter, and I was brought to a white screen. At first I was confused and slightly worried about what was happening. I just stared at the screen for a moment, and then saw a line dash across the screen, and jumped back a bit in my seat. Then I saw another line, and another, then three, then five, and then a blur of lines zoom across the screen, forming the words “Infinity”, and all of the tabs and images displayed for the game appeared below, which were breath-taking. I went to click sign-up, but then saw the tab: “Alpha-Testers/Volunteers” on the list, and decided to click that instead. When I did, a large list of people appeared that went in order by the date they entered the program. I scrolled down the list, seeing some of my past-favorite gamers, such as Mark Fischbach, properly known as Markiplier, Seán McLoughlin, or Jacksepticeye, there were all of the Game-Grumps members, and so on. I kept on looking, and started to get bored at staring at such a long list, when my eyes opened up slightly more when I came across three familiar names - Ben, Dark, and Gavin. I stared hard at the names, then looked at the date, which was dated on May 17, 2015. I immediately called out, “Yeah, I’m in my room”, and minimized the tab as my dad opened the door. I felt my heart skip a beat, and I quickly spun my chair back towards the monitor, and looked at all of the gamer’s names, seeing my friends peeking from the bottom. I quickly spun back to face my Dad. GAME PAUSED: Come back next month for "Infinity: Level Two: The Truth Hurts." And sunk onto the ground. It’s mouth gaping wide open. Made them appear like clawed hands. And away from The Wind. But faces that didn’t show kindness. As The Wind struck out all of their light. My alarm waking me up at 12:00 a.m.
You’re not very good with scary movies, are you? Don’t really like the typical haunted houses either? Those monsters really get too close, don’t they? Still want to feel in the Halloween spirit without all the really scary things? This month’s not-as-scary Destination of the Month is The Mary Nohl House: The Witch of Fox Point. Mary Nohl was a sculptor born in 1914 and died in 2001. 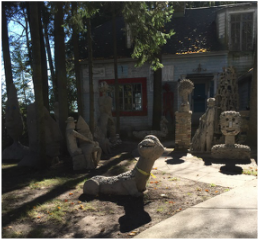 Her home is completely surrounded by curious sculptures, and the house filled with rumors of why she made them. 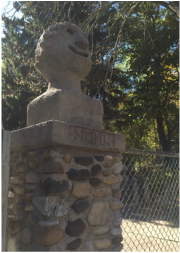 An old legend was that the poor old woman’s husband and son drowned near the house in Lake Michigan, and the sculptures were to make up for their loss, however, Mary Nohl was never married. She lived alone in an old family home as she turned the entire yard and inside into a nationally recognized home. 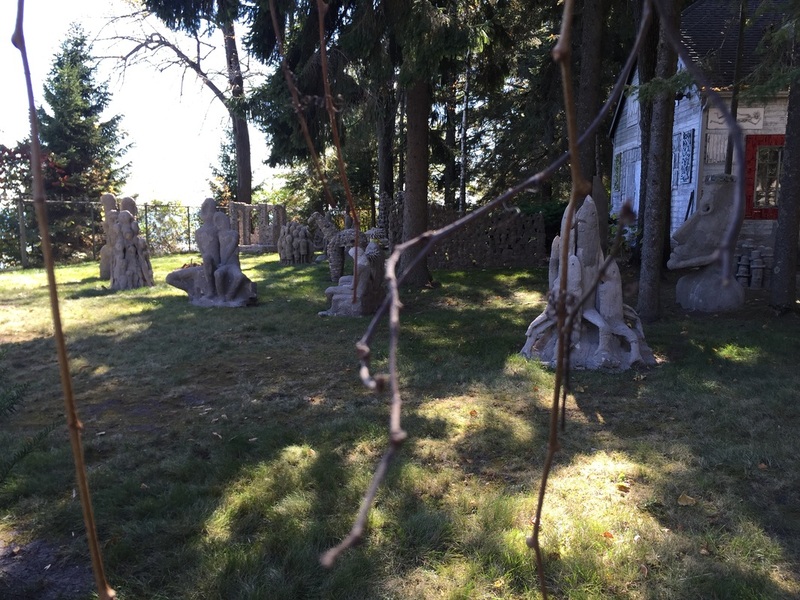 The home is not open to the public, due to many attempted vandalisms, but you can still see the many weird and unusual sculptures from outside the fence. 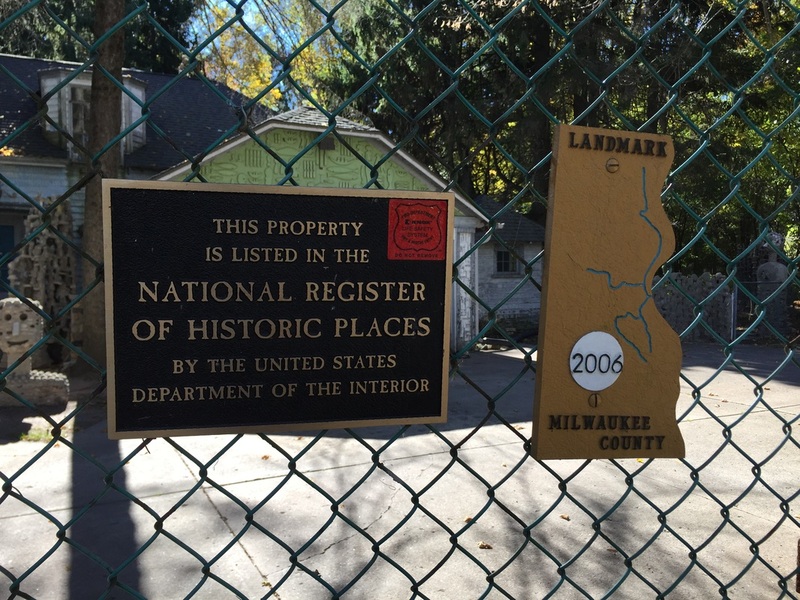 Her home is a Milwaukee County Landmark, a part of the Wisconsin and National Registry of Historic Places, and all of her artwork belongs to the John Michael Kohler Art Center. Maybe it’s not entirely scary, but don’t the sculptures give you chills? See them in person at 7328 N. Beach Drive. Parking might be a little difficult to find, but if you’re a sucker for this kind of stuff, it really is intriguing! A young popular boy was looking for a date to go with him to the school’s Halloween dance. He had acquired the reputation of a heart-breaker and a jock - he was the football team’s head quarterback. He’s had a bit of a luck in finding a date for dances in the past, but this time he seemed to have had none. More commonly now, people referred to him as a jerk because he was always messing with girls’ feelings, and things always tended to end badly. Despite this, he had his eyes set on one of the most beautiful girls he had ever seen. He was so in love that he decided to invite her to accompany him to the dance as his date. She accepted because she hadn’t yet learned of his bad rep; she was a new student who had transferred from another high school. She asked if he could pick her up and they quickly agreed on 7 o’clock. Later that day, he went to pick her up at what he thought was her house. They drove over to the dance and were lucky enough to park pretty close to the entrance. At the dance, they cut a rug and had a lot of fun. She acted normal, however, something about her seemed a bit off. The boy sensed that she may have been a little sad; throughout the night she seemed to go back and forth between being loud and filled with joy, and then somber and considerably more quiet. Once the dance was over, at about 10 o’clock that night, she asked him if he could give her a ride home. So as not to leave her stranded, he reasonably said yes. He began to drive and she directed him towards her house. He was a bit confused - this wasn’t the same route he had taken before. After arriving at her home, he realized something else… that her home was a cemetery. This newfound knowledge was enough to frighten him. When she left the car without opening the door, effortlessly passing through it as if she was only an apparition. He turned so pale he looked like a ghost himself. To say he was shocked would be an understatement; he had just driven his ghost date home to a cemetery. She left leaving nothing but her purse she behind. The boy turned off his car and passed out on the steering wheel. He woke up in the same place at about noon the next day. He deduced that the recent events were nothing more than a bad dream he had while sleeping in the car. He decided to go home, still haunted by the reality that he had unknowingly taken a ghost to the school dance. Before taking off, he noticed that his cellphone had several missed calls from his mother. Upon calling her back, she asked why he hadn’t been home. He told her that he had fallen asleep in the car and would return home later that day. That morning, he noticed the purse the ghost had left. It contained a slip of yellowed paper with an address written on it. Curious, he drove to the address. Once there, his immediate thoughts were that the house was a bit old, yet very clean for the amount of years it had probably been standing. He knocked on the door. The door slowly screeched open, revealing an old man that seemed to be in his mid-50s. He was supporting himself with a fancy carved cane. The boy asked if he knew the girl that owned the purse that had been left in his car last night. Gazing into the distance, almost as if looking for something in the air, the man answered that he was the father of the girl, however, that she had passed away. The man answered, “She died 19 years ago.” He began to tell the boy all about his daughter; she was a young and beautiful girl who always wanted to go to school dances, but he and his wife had never let her. They just wanted to protect her from getting her heart broken since she was rather sensitive. They were overprotective because they cared for her safety. He recalled the day she went out in secret, while he and his wife had been asleep. She had her fun but she found out that her date had a girlfriend. She was afraid of her parents so she decided to keep it to herself. However, she was still angry and decided to tell him on the way home. While also making sure to return before her parents had awoken and found out she was gone. She glanced at the clock and soon realized she was running out of time, he asked her date if he could take her back home fast. Her date went as fast as he could and he missed a red light… a horrible accident ensued. There were no survivors. When her parents heard the news, they were saddened by the fact that she died while trying to do the thing she always wanted to do - go to a school dance. He still lives haunted by the fact that he dated a ghost. For a long time after the incident he often had flashbacks of the ghost girl from the dance. From this experience he took away one thing: he never played with other people’s feelings again because she had her heart broken by a boy like him.